Honda Motorcycle and Scooter India (HMSI) has launched the Honda X-Blade in India at a price of Rs 78,500 (ex-showroom, Delhi). Bookings for the Honda X-Blade had been opened last month at all dealerships across the country. At the time, HMSI had assured that the Honda X-Blade will be priced under Rs 79,000. The Honda X-Blade was revealed for the first time at the Auto Expo 2018 in early February. The Honda X-Blade features a 162.71cc single cylinder HET engine, producing 14.1PS and 13.9Nm. Bookings can be made at any dealership for a booking amount of Rs 5,000, and deliveries of the Honda X-Blade have commenced now. The X-Blade is the first motorcycle in its segment to feature an all-LED headlamp setup. Within Honda's lineup, it is priced around Rs 2,000 lower than the Honda Hornet 160R. The X-Blade has very sharp styling, an aggressive tank design, as well as a dual outlet muffler.It is clearly aimed at appealing to the youth with these elements. The X-Blade comes fitted with a 130mm wide tyre as well as monoshock suspension. It also has a gear position indicator, hazard switch, as well as a service due indicator on the instrumentation. The Honda X-Blade is available in five colours - Matte Marvel Blue Metallic, Matte Frozen Silver Metallic, Pearl Spartan Red, Pearl Igneous Black, and Matte Marshal Green Metallic. 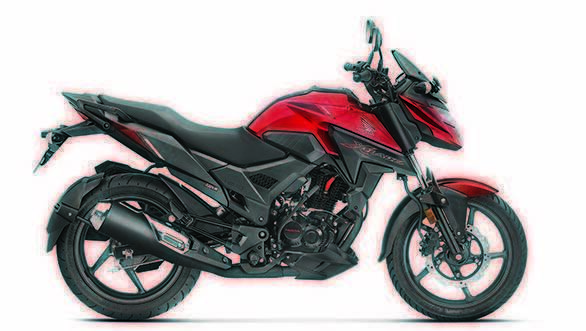 The Honda X-Blade will compete with the likes of the Suzuki Gixxer and the Bajaj Pulsar NS160.